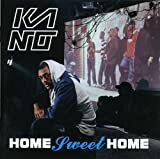 Kano made a name for himself on the East London UK Garage Grime undeground, chatting lyrics over dubs and battling with other MC’s. He’s also a regular guest on the various Garage shows on BBC 1Xtra (another thing which makes me proud to be part of the BBC). There’s some great freestyling from him on the excellent Lord of the Mic: Battle Arena Vol 1 (check out this sample [mp3]). However, like Wiley and Mercury-prize winning Dizzee Rascal, Kano’s chosen move away from the heavy, fierce, grime sound with this first commercial offering. There’s still some great collaborations here however – Mike “The Streets” Skinner, Terrah Danjah and D Double E to name a few. Here in East London, well Bethnal Green, Bow and Mile End to be precise, is the archetypal home of grime – the dark and sometimes subversive sub-genre of the currently out-of-favour UK Garage. The underground scene’s come along way since the days of So Solid Crew making the news with their gun touting lyrics, who touted real guns to back it up. There’s kids on the estates (Americans: think “projects”) coming up and putting out some really great music. This is the garageband generation, where an off-the-shelf Mac Mini or even a PC and a free copy of Pro Tools can be used to produced whole albums to inspirational music. Previous Post More Grok please, we’re British!